(2:46 p.m. EDT) -- Carnival Cruise Line's new, yet-to-be-named ship will call Port Canaveral (Orlando) home when it launches in 2020 as the largest in the fleet, as well as in the world by passenger capacity. The line has reached an agreement with the Canaveral Port Authority to accommodate the 6,600-passenger (at max capacity) ship in the port's new state-of-the-art terminal; terms of the agreement will be finalized on August 29, 2018. Work began on the new terminal in April 2018 and is expected to be complete between late 2019 and early 2020, months before the new ship's debut. 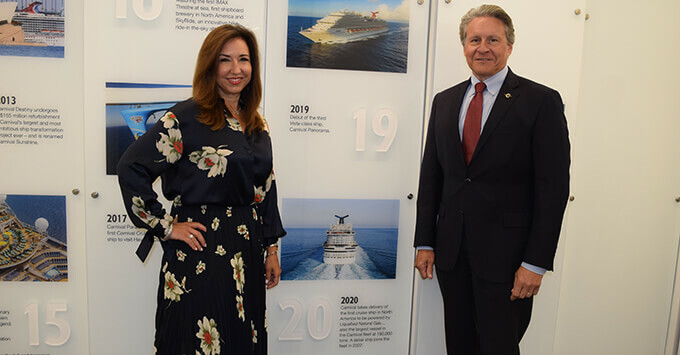 "We are very excited about the prospects of homeporting our largest ship at Port Canaveral, a valued business partner for more than 25 years," said Christine Duffy, president of Carnival Cruise Line. "Easily accessible from all over the southeast with excellent facilities and friendly staff, Port Canaveral is one of our most popular and fastest-growing homeports. This fantastic new ship, coupled with our future plans for Port Canaveral, will provide guests with an unparalleled seagoing vacation experience from the minute they arrive." The new ship will blend Carnival staples with a variety of groundbreaking firsts -- not only for the line, but also for the industry. It also will be the first in North America to be powered by Liquefied Natural Gas, an environmentally friendly fuel that produces nearly zero emissions. Construction of the new cruise ship is slated to begin in November 2018. More details of its features, as well as the itineraries it will offer from Port Canaveral, will be revealed in 2019. Carnival's next new ship, Carnival Panorama, is scheduled to launch in November 2019.